NYISO’s Power Trends 2017 report shows an electric system of flat peak demand adapting under pressure from both public policy requirements and changes in consumption patterns. However, stark regional differences make the ISO “a tale of two grids,” CEO Brad Jones said in a media briefing on the annual report May 18. The report, which is based on data from the ISO’s 2017 Load & Capacity Data report, or “Gold Book,” also highlights the emergence of distributed energy resources, which, in addition to serving the owners’ needs, can also provide benefits to the larger wholesale market. The report forecasts peak demand in New York to grow at an annual average rate of 0.07% from 2017 through 2027, a decrease from the 0.83% annual growth projected in 2014 and the 0.21% predicted in 2016. Absent the impacts of energy-efficiency programs and DER, the 2017 peak demand growth rate is 0.73%. 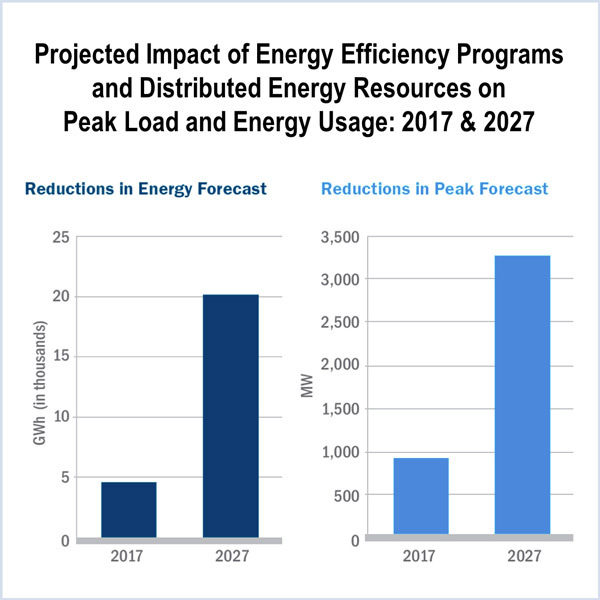 The report projects energy efficiency will reduce New York’s peak demand by 230 MW in 2017 and by 1,721 MW in 2027 with annual energy usage cut by 1,330 GWh in 2017 and 2,533 GWh in 2027. NYISO projects distributed solar resources in New York to reduce peak demand by 450 MW in 2017 and by 1,176 MW in 2027, and to lower annual energy usage by 1,845 GWh in 2017 and by 5,324 GWh in 2027. Other behind-the-meter resources may reduce peak demand by 233 MW in 2017 and by 375 MW in 2027, while possibly cutting annual energy usage by 1,584 GWh in 2017. 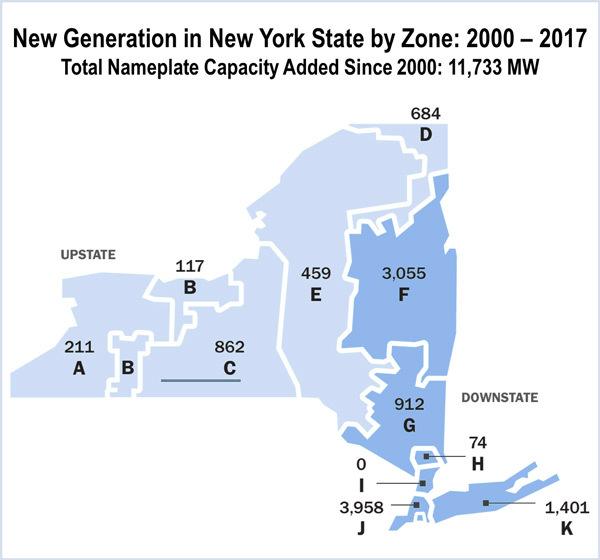 Since 2000, private power producers and public power authorities have added 11,733 MW of new generating capacity in New York, or approximately 30% of the state’s current generation. The report says more than 80% of that new generation is in southern and eastern New York, where power demand is greatest. Jones said New York’s wholesale market design, which includes locational-based pricing and regional capacity requirements, is encouraging investment in areas where the demand for electricity is highest. He also said that energy efficiency and market improvements have saved $7.8 billion in New York since 2000. In suggesting improvements, how closely had the MMU worked with The Brattle Group, which is conducting the carbon-pricing study referred to by Jones? New York's ambitious clean energy goals will require new and upgraded transmission lines to achieve, according to NYISO's annual Power Trends report. The NYISO Management Committee discussed the latest Reliability Needs Assessment and a heat wave in August that prompted a mandatory systemwide demand response event.